Rodney was a rabbit who loved nothing more than drawing. He never found it tiresome, tedious or boring. But then one day, disaster struck, the one thing Rodney feared, while working at his drawing desk his pen just... DISAPPEARED! 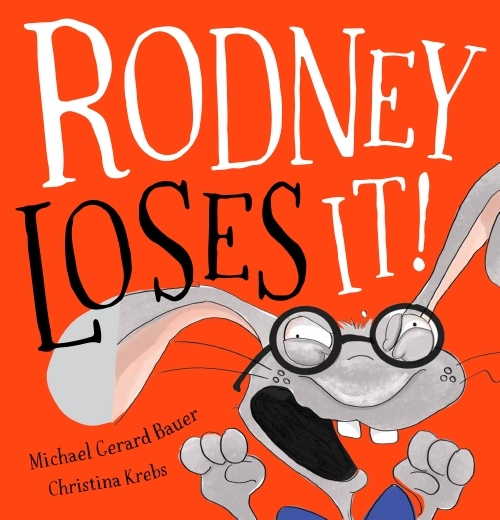 A truly hysterical search for a missing pen, by award-winning author Michael Gerard Bauer. I was born in the suburb of Ashgrove (the setting of The Running Man) in Brisbane, Australia. Now I live about a kilometre away in the neighbouring suburb of Enoggera. Look how far I’ve come! Sadly yes. When I was in Grade 4 we had a teacher who liked to give everyone a nickname. Because of how my surname in pronounced I was Bow Wow for a while. I could have been a Rapper! A bit shorter and I didn’t have the beard. Apart from that, I was fairly quiet except around my friends and got on well with everyone. About the only thing I hated about school was giving talks in front of the class — just like Ishmael. The first largish book I read all by myself when I was little was The Wind in the Willows. It’s one of the few books I remember re-reading a number of times. I loved the characters. Later on I had the same feeling about The Hobbit. There are lots of authors I could list but perhaps Roald Dahl could get a particular mention. Oh and I also get ten dollars every time I mention Barry Jonsberg. So yeah Barry Jonsberg would be another one. Did you get that? Barry Jonsberg. My favourite food as a kid was lamb chops and also crumbed lamb’s brains (Yum!). Now I like all sorts of different foods. I haven’t really got a favourite colour although as a Queenslander I am naturally fond of maroon. Not a big fan of blue. I have too many favourite movies to name just one. Lots of great writers, past and present inspired me with their novels, plays, poetry and songs. As a teenager I really wanted to be a singer-songwriter so I was mostly inspired by singer-songwriters like Bob Dylan. I was inspired to try to write my first book mainly by the novels of Markus Zusak. I was a secondary school teacher of English and Economics who dreamed of being a writer. One day a story found me that I couldn’t stop thinking about and I eventually resigned from my job to try to write it. The story started from a memory I had as a young boy looking for silkworms on the mulberry tree in our backyard. It gradually grew into The Running Man. I started late. I was 44. Because I always loved words and stories, and I had something I wanted to say. I’m really not sure. They seem to come from some magical place. But I’ve learned that going for long walks is a fantastic way to encourage them. I always say that I never go looking for stories, they find me. Not sure how ‘special’ it is. I write at home. Either at the computer in our upstairs study or downstairs in a little writing nook. It usually depends on the weather. It’s cooler downstairs. I don’t like distractions or people near me when I write. I rarely write when I’m away from home, and never in cafes or in the public or listening to music. Being a writer is the best thing. You get to make up your own world and you’re the one who decides who enters it and what happens there. Then you get to share it with other people. What’s not to like? It’s also wonderful when some of those people you share it with, say they loved what you created. Yes, but none that I’d like to share here! I do lots of school visits, speak at Writers Festivals, spend time with my family, read, play guitar, go to the movies, watch TV, watch sport, occasionally play sport, have fun with friends, go on holidays, mow the lawn, do some gardening, appear briefly in some of my son Joe’s films, spend far too much time on facebook, try to catch up with my blog and in general, just have a life. I was a high school teacher and I’m glad I had that career but I would choose to be a singer-song writer or part of a band or a photographer or do something involving animals and nature like my daughter Meg who works for the Wilderness Society. Maybe Shakespeare. There’s a lot of mystery surrounding who he really was so I’d have lots of questions to ask him about his background and his schooling and how he came to write his plays. There is, but the Government Spy Agency I work for said I had to keep all that stuff top secret. Even my wife doesn’t know about my super-powers.